This course is a review of common autoimmune diseases, their etiology, clinical signs, effect on oral health and palliative treatment available in the dental setting. The immune system functions as a damaging cell destroyer affecting the body by obliterating unhealthy invading cells in the human body. Autoimmune diseases are conditions that occur due to an impaired immune response, which attacks the normal healthy body cells. Inflammation, a classic sign of an autoimmune disease, affects many of the body’s systems. Oftentimes the first signs and symptoms of the disease are often found within the oral cavity and can influence the patient’s diagnosis. Autoimmune disease prevalence is increasing which warrants oral care professionals to be aware of the signs, symptoms and prescription side effects of the Systemic Lupus Erythematosus, Lichen Planus and Sjogren’s Syndrome. Systemic Lupus Erythematosus (SLE), a chronic inflammatory autoimmune disorder, affects both the internal and external systems of the body. Musculoskeletal, neuropsychiatric, cardiac, hematological and mucocutaneous zones are most commonly involved. Lupus predominantly affects women at a rate of 6:1 1 Feldman, Candace H., et al. “Epidemiology and Sociodemographics of Systemic Lupus Erythematosus and Lupus Nephritis among U.S. Adults with Medicaid Coverage, 2000–2004.” Arthritis and Rheumatism, U.S. National Library of Medicine, Mar. 2013, www.ncbi.nlm.nih.gov/pmc/articles/PMC3733212/. and most often occurs between 15 and 44 years of age when estrogen levels are at their highest (Test question #7). While the exact cause of the immune system dysfunction is unknown it is suspected that hormonal abnormalities are associated with the origin of SLE. The most common symptom of the disease, coined “lupus” by 13th century physician Rogerius for its external symptom’s resemblance to wolf bites, 2 “The History of Lupus.” Lupus Resource Center, Lupus Foundation of America, 26 Sept. 2017, resources.lupus.org/entry/history-of-lupus. includes a characteristic butterfly rash on the cheek. (Fig.1) Rashes can vary from mild to severe and include itching and a feeling of warmth. The skin is involved in up to 85% of SLE patients. 3 Uva, Luís, et al. “Cutaneous Manifestations of Systemic Lupus Erythematosus.” Autoimmune Diseases, Hindawi Publishing Corporation, 2012, www.ncbi.nlm.nih.gov/pmc/articles/PMC3410306/. Internally, SLE can vasoconstrict blood vessels of the fingers, an event referred to as Raynaud’s phenomenon, (Test question #3) leading to cyanosis and numbness of the fingers. Vasoconstriction of small blood vessel allows the body to retain heat leading to inflammation. This inflammation may result in joint, peritoneal (walls of the abdominal cavity) and pleuorpericardial (sac surrounding the lungs and heart) symptoms. Patients find that stress, sunlight exposure, pregnancy, being overworked and emotional problems trigger these internal manifestations. During stress patients, who are experiencing a lupus flare, notice that nausea, headache, dizziness, weakness, chills, fever and confusion can occur. SLE patients are often plagued with oral conditions that can be found by dental clinicians during a routine exam. Ulcerations and burning mouth, erythema and/or keratosis are symptoms commonly seen and are found on the gingiva, buccal mucosa and palate. 4 Khatibi, M, et al. “The Prevalence of Oral Mucosal Lesions and Related Factors in 188 Patients with Systemic Lupus Erythematosus.” Lupus, journals.sagepub.com/doi/abs/10.1177/0961203312454589.. Salivary gland dysfunction and TMJ issues are seen with patients who are afflicted with SLE. Increased dental caries, periodontal disease and candidiasis can be contributed to salivary gland deficiency. Temporomandibular joint (TMJ) discomfort is also triggered by the inflammatory response and the use of immunosuppressants 5 Ergun S, Katz J, Cifter ED, Koray M, Esen BA, Tanyeri H. Implant-supported oral rehabilitation of a patient with systemic lupus erythematosus: case report and review of the literature. Quintessence Int. 2010;41:863–867. Symptom assessments, physical examination, X-rays, and lab tests lead to patients being diagnosed with lupus. 6 “Lupus.” Centers for Disease Control and Prevention, Centers for Disease Control and Prevention, 12 Oct. 2017, www.cdc.gov/lupus/facts/detailed.html. Blood tests are used to determine if a patient has anemia, commonly seen with the disease, due to inflammation hindering the formation of red blood cells. Low white blood cells and platelet counts are often seen in the disease as well. If lupus has affected the kidneys their urinalysis will show levels of high protein. 7 “Lupus.” Mayo Clinic, Mayo Foundation for Medical Education and Research, 25 Oct. 2017, www.mayoclinic.org/diseases-conditions/lupus/diagnosis-treatment/drc-20365790. While there is no cure for SLE patients are treated by rheumatologists for palliative treatment with use of long-term corticosteroids, aspirin, hydroxychloroquine (antimalaria drug) and prednisone. Lichen planus is an autoimmune disease commonly affecting not only oral mucosa but also skin, vaginal mucosa, nails and scalp. The term lichen planus means “small flat bumps on the skin” 8 Foundation, The British Skin. Lichen Planus, www.britishskinfoundation.org.uk/SkinInformation/AtoZofSkindisease/LichenPlanus.aspx and presents itself as such. It is seen intraorally as bilateral reddish-purple shiny bumps intertwined with white striations, called Wickham’s striae. (Test question #4) Its netlike form has a lace like striation of raised white lines resembling leukoplakia. (Fig 2) . These bumps can be sore and become raw increasing the chance of infection 9 “Lichen Planus.” Lichen Planus | American Academy of Dermatology, www.aad.org/public/diseases/rashes/lichen-planus#symptoms.. There is limited information as to the number of those afflicted with lichen planus although it is known to be more common in women, typically between ages of 30-60. Allergic reactions, stress, anxiety, viral infections, Hepatitis C may play a role in its origin. A biopsy of affected tissue can be performed to diagnose lichen planus. Hepatitis C testing may also be completed, since it is a known trigger for the disorder. While lichen planus typically is a benign condition, monitoring by oral care professionals is imperative as 0.2-0.5% of cases turn malignant. Managing the symptoms of lichen planus involves prevention. Mechanical trauma such as ill-fitting dentures, sharp dental cusps and sharp foods can lead to abrasions which initiate the lichen planus flare and should be avoided. Chemical reactions from spicy, acidic foods and beverages should be avoided as well. Oral homecare measure should be put into place as bacterial plaque aggravates the symptoms. 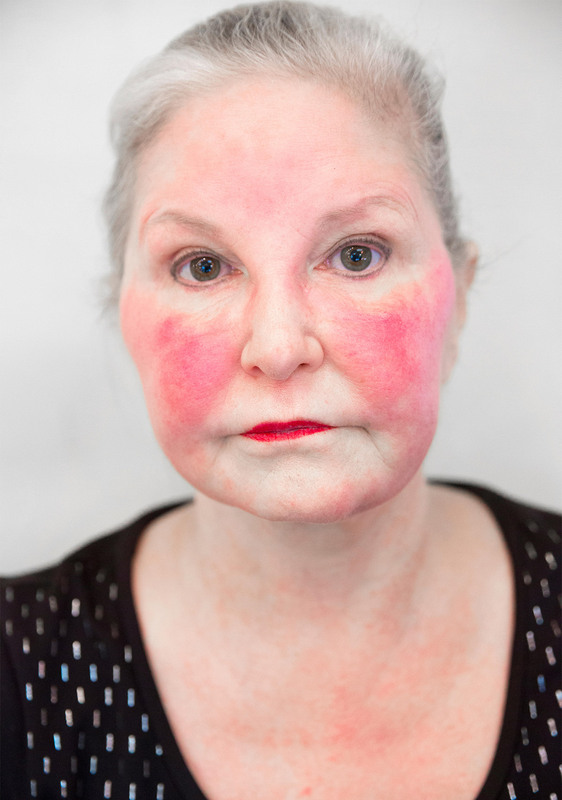 Physicians may prescribe systemic medications such as antihistamines to prevent itching and corticosteroids, retinoids, calcineurin inhibitors and ultraviolet therapy to reduce duration of the symptoms. Sjogren’s Syndrome (SS), named after Dr. Henrick Sjogren, a Swedish ophthalmologist who discovered the disease in 1933, is a chronic, autoimmune, inflammatory disorder characterized by the decrease in lubricating fluids in the glands of the eye and mouth. These glands, which secrete fluids, are destroyed by T cell lymphocytes, the white blood cell that acts in the body’s defense, by penetrating and destroying them. 10 Singh, N., and P. L. Cohen. "The T Cell in Sjogren's Syndrome: Force Majeure, Not Spectateur." Journal of Autoimmunity. U.S. National Library of Medicine, Sept. 2012. Web. 13 Apr. 2017. Salivary glands, especially the parotid gland, are enlarged in one-third to one-half of people with Sjogren’s. The onset of the syndrome is between the 4th and 5th decade of life and affects .1 - 4% of the US population with the female to male ratio being 9:1. 11 Patton, Lauren L. The ADA Practical Guide to Patients with Medical Conditions. Ames, IA: Wiley-Blackwell, 2012. Print. Those diagnosed with SS commonly have multiple autoimmune diseases such as rheumatoid arthritis, lupus, scleroderma (hardening of the skin when connective tissue loses its elasticity) and fibromyalgia (widespread muscular pain ). Confirming a diagnosis of Sjogren’s Syndrome can be challenging. The symptoms vary and mimic symptoms of other conditions such as menopause, prescription side effects or other medical conditions such as lupus, rheumatoid arthritis, fibromyalgia, chronic fatigue and multiple sclerosis. 12 Expert, Patient, and Dorian Martin. “Sjögren's Syndrome Can Mimic Menopause Symptoms – Menopause | HealthCentral.” HealthCentral: Health News and Advice. Trusted Medical Information, Healthcentral, 9 May 2017,www.healthcentral.com/article/sjgrens-syndrome-can-mimic-menopause-symptoms. (Test question #9) Multiple tests may be used to confirm the diagnosis of SS. Questionnaires, blood tests, ophthalmologic and salivary testing can help confirm the diagnosis. Patients suspected of having Sjogren’s are given a subjective test known as the European League Against Rheumatism (EULAR) Sjogren’s Syndrome Patient Reported Index (or ESSPRI) to help in reaching a diagnosis. 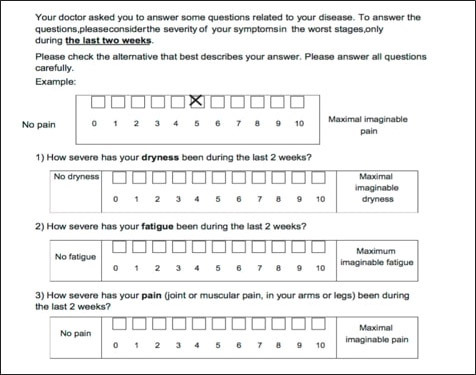 Patients are asked on an ESSPRI to rate their symptoms in the previous two weeks on a scale from 0-10. The worst pain is scored a 10 and no pain is scored a 0. They are asked questions about joint pain, fatigue and dryness. 13 Paganotti, Maurício Aquino, Valéria Valim, Érica Vieira Serrano, Samira Tatiyama Miyamoto, Raquel Altoé Giovelli, and Maria Carmen Lopes Ferreira Silva Santos. "Validation and Psychometric Properties of the EULAR Sjögren's Syndrome Patient Reported Index (ESSPRI) into Brazilian Portuguese." Revista Brasileira De Reumatologia (English Edition) 55.5 (2015): 439-45. Web. (Fig 3) The final diagnosis is accomplished through blood, ophthalmologic and salivary testing. Blood Tests can also be done to determine if an autoimmune disease is precipitating a patient’s symptoms. Antibodies produced by the body’s immune system, which attacks normal healthy body tissue are found by testing for Rheumatoid Factors. The RF attack result in inflammatory symptoms, such as inflammation of joints. 70% of patients with Sjogren’s test positive for this antibody test. This test measures the antibodies triggered by an antigen found in Sjogren’s patients. 30% of patients who have subsequently been diagnosed with Sjogren’s SS-A autoimmune antibody test has been shown to have a false negative test result. Erythrocytes (red blood cells) require a period of time to settle at the base of a vial after a blood test. When the sedimentation rate is elevated it indicates that there is inflammation and the presence of a chronic disease. Additional blood tests must be performed to create a definitive diagnose a patient’s disease. An elevated IGs level indicates that the normal blood proteins are participating in an overactive immune reaction. Ophthalmologic Tests are performed by physicians to measure tear production and visualize corneal issues with ophthalmologic testing. The following tests are completed on a patient suspected of SS. The Schirmer test measures tear production. This involves numbing the eye and placing a test strip under the lower eyelid to measure that amount of tears, preferably 10 mm, over 5 minutes. Dying agents are applied to the eye to stain the cells that lack healthy mucin barriers. 14 Beckman, Kenneth A., Jodi Luchs, and Mark S. Milner. "Making the Diagnosis of Sjögren’s Syndrome in Patients with Dry Eye." Clinical Ophthalmology (Auckland, N.Z.). Dove Medical Press, 2016. Web. 14 Apr. 2017. A salivary gland biopsy is performed to determine if lymphocytic clumps are present creating chronic inflammation. A small area of tissue is incised and examined microscopically for lymphatic infiltration. This test involves an injection of a radioactive isotope that is tracked over time to determine how quickly it reaches the salivary glands. Dental professionals have the potential for recognizing signs of autoimmune diseases before patients notice symptoms and consult their physicians. Patients may perceive their symptoms as an aging issue and may not fully understand that their progression could further hinder their active lifestyles. Comprehensive dental examinations will help clinicians document changes occurring with their patients. Thorough dental examinations will include an evaluation of restorations and oral prosthesis, ensuring that dentures are not ill fitting and that they can be worn comfortably and that any current restoration are void of rough areas. Radiographs and non-ionizing diagnostic caries detecting tools can help find demineralization so that areas can be remineralized decreasing stressful operative appointments which may increase a patient’s incidence of an autoimmune flare. Deformity of joints, such as the temporomandibular (TMJ), can create pain. Inflammation can cause the synovial membrane, the joint’s cartilage cover, to thicken and abnormal granulation tissue, known as pannus, to form. Bite evaluations with occlusal adjustments can be made to reduce the pressure on the joint. 22 Jonsonn, Roland, et al. “Temporomandibular JointInvolvement in Systemic Lupus Erythematosus.” Arthritis and Rheumatism, vol. 26, no. 12, Dec. 1983, pp. 1506–1510. The most common symptom of these autoimmune diseases seen in dental practices, hyposalivation, can be evaluated and result in referrals to physicians for definitive diagnosis and anticipatory guidance. Patients may not perceive xerostomia until long after hyposalivation has begun. They may describe their saliva as ropy and thick. (Test question #5) Taste disorders may develop as a consequence of inadequate saliva and an inability of food to reach the taste buds 16 Negoro, A., M. Umemoto, M. Fujii, M. Kakibuchi, T. Terada, N. Hashimoto, and M. Sakagami. "Taste Function in Sjögren's Syndrome Patients with Special Reference to Clinical Tests." Auris, Nasus, Larynx. U.S. National Library of Medicine, June 2004. Web. 24 May 2017. They may notice voice changes and the inability to speak for long periods of time due to dryness. In the later stages of hyposalivation they may be unable to eat dry foods, may have sleeping disturbances due to nocturia, a consequence of sipping water throughout the night to stay lubricated, and have an inability to wear dentures. Palpating extraorally will allow the clinician to determine if any swelling of the parotid gland is present. Recurrent parotid inflammation appears to be an initial indicator of SS. 17 Mizuno, Y., T. Hara, K. Hatae, T. Hirano, K. Ueda, N. Nakamura, and Y. Mizoguchi. "Recurrent Parotid Gland Enlargement as an Initial Manifestation of Sjögren Syndrome in Children." European Journal of Pediatrics. U.S. National Library of Medicine, Feb. 1989. Web. 07 Apr. 2017. It is found that major salivary gland swelling is more common than minor salivary glands. Clinicians can visualize the lack of pooling of saliva under the tongue or may experience themselves the sticking of the dental mirror to the oral mucosa. Caries Management By Risk Assessment (CAMBRA) exams incorporated into a general dental practice setting will allow patients to gain knowledge of their symptoms. 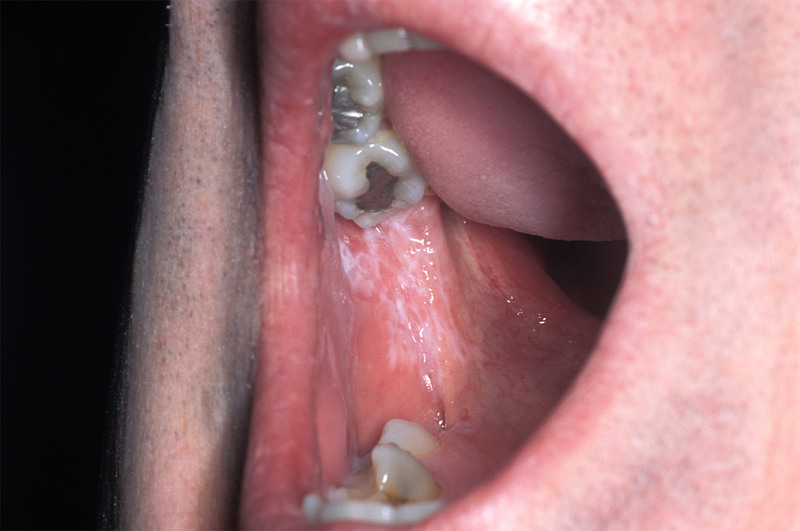 The presence of white spot decalcified lesions or dental caries in unusual areas such as the mandibular anteriors could indicate a change in salivary composition such as an increase in candida. 18 Pedersen, Anne Marie Lynge, Allan Bardow, and Birgitte Nauntofte. "Salivary Changes and Dental Caries as Potential Oral Markers of Autoimmune Salivary Gland Dysfunction in Primary Sjögren's Syndrome." BMC Clinical Pathology. BioMed Central, 2005. Web. 19 May 2017. When hyposalivation is observed the patient’s medical history must be reviewed and patient questioned as to changes in medical conditions or medications that have side effects of dry mouth. The reduced quality of saliva is detrimental to the oral cavity. Patients are at a greater risk of developing dental caries when the saliva can no longer buffer the oral acidity level or remineralize the areas demineralized by those acid attacks due to changes in its composition and flow rate. 19 Bolstad, Anne Isine, and Kathrine Skarstein. "Epidemiology of Sjögren's Syndrome-from an Oral Perspective." SpringerLink. Springer International Publishing, 02 Sept. 2016. Web. 07 Apr. 2017. Simple salivary pH testing can be performed chair side with pH testing strips to determine the acidic nature of the saliva so that changes can be made to a patient’s oral hygiene routine. It is shown in studies that chronic periodontitis patients have a lower pH than those with gingivitis. 20 Baliga, Sharmila, Sangeeta Muglikar, and Rahul Kale. "Salivary PH: A Diagnostic Biomarker." Journal of Indian Society of Periodontology. Medknow Publications & Media Pvt Ltd, 2013. Web. 19 May 2017. This indicates that the buffering ability of saliva is important to stabilize teeth in the oral cavity. Immunosuppressants are often prescribed to a patient for an autoimmune disease have the potential to delay a person’s ability to heal and increase infections. Consultations with a patient’s physician should be made before invasive procedures. Care should be taken when treating patients on corticosteroids as an adrenal crisis may occur. The long-term use of corticosteroids decreases the adrenal response and the patient’s ability to handle stress. The adrenal gland releases cortisol, a hormone important for controlling blood pressure, and adrenaline, both of which are released in stressful situations. The typical signs of an adrenal crisis are weakness, fatigue, anorexia, salt craving and orthostatic hypotension. 23 Neary, Nicola, and Lynnette Nieman. “Adrenal Insufficiency- Etiology, Diagnosis and Treatment.” Current Opinion in Endocrinology, Diabetes, and Obesity, U.S. National Library of Medicine, June 2010, www.ncbi.nlm.nih.gov/pmc/articles/PMC2928659/. Dental care should be delayed for patients who have not been treated for this condition. Alleviating symptoms and anticipating the care that the patient may require is crucial. Increasing the frequency of oral evaluations will enable clinicians to assess that patient’s symptoms in earlier stages decreasing the chances of more invasive procedures. It is during these appointments that it will be determined if a patient may need to modify their home care, implement dietary changes or be prescribed medications for their oral symptoms. In cases of SLE in which a patient has Reynaud’s phenomenon a home care regimen should be in place, which will allow patients to care for their oral health while having numb fingers. Toothbrushes adapted with larger handles or interproximal devices that do not need fine motor skills for their use should be in place. Lichen Planus treatment includes having the patient avoid mechanical trauma and chemical trauma. Many times, acidic and spicy foods may create chemical trauma to the oral mucosa and cause a flare up the disease. Since periodontal bacterial in plaque exacerbates the condition and has the potential in increase a lesion’s chance of becoming more invasive oral home care should be meticulous and include home care aids that patients are taught how to use at their biannual examinations. An alcohol-free chlorhexidine gluconate mouth rinse is helpful as it antimicrobial and does not irritate the tissue. Smoking and alcoholic beverages should be avoided to reduce pain. Patients affected by hyposalivation, especially those with SS, may be prescribed pilocarpine from their physician to increase the production of saliva. Products containing xylitol have the potential to increase salivary flow while neutralizing pH. Their living spaces could be outfitted with a humidifier to alleviate the dryness in the air and saline nasal sprays can be used to lubricate clear nasal passages to decrease oral breathing. 24 Sjogren's Syndrome Lifestyle and Home Remedies. Mayo Clinic. N.p., n.d. Web. 13 Apr. 2017. Drinking liquids with meals and the use of sauces, gravies, mayonnaise and broth will make food easier to swallow. Fungal infections that occur in SS such as angular cheilitis, described as painful cracking, scaling, bleeding, and ulcerations at the corners of the mouth), 25 Devani, Alim, and Benjamin Barankin. “Answer: Can You Identify This Condition?” Canadian Family Physician, College of Family Physicians of Canada, June 2007, www.ncbi.nlm.nih.gov/pmc/articles/ PMC1949217/. can be treated with a nystatin/triamcinolone ointment applied topically 4 times daily. Oral Candidiasis can be treated with clotrimazole lozenge (10 mg dissolved orally 4-5 times a day for 10 days). Dentures may also be soaked for 30 minutes in chlorhexidine or 1% sodium hypochlorite. 11 Patton, Lauren L. The ADA Practical Guide to Patients with Medical Conditions. Ames, IA: Wiley-Blackwell, 2012. Print. The salivation dysfunction of SLE and SS patients can cause an increased caries rate. In order for remineralization of teeth to occur it is important that saliva be present. If hyposalivation is present, as indicated by the results of the unstimulated salivary flow test which can be done chairside in a general practice, patients will be counseled on the decreased remineralization that can occur resulting in increased carious lesions. Medications to increase salivary flow and products with ingredients can be used to help prevent demineralization. The natural 5 carbon sugar reduces the formation of plaque and reduces the acidic environment needed for demineralization. Mutans streptococci, the bacteria associated with dental decay, is inhibited by xylitol’s use. The forms of xylitol come in lozenges, gums, toothpastes, rinses and in sugar granules. 26 Janakiram, Chandrashekar, et al. “Xylitol in Preventing Dental Caries: A Systematic Review and Meta-Analyses.” Journal of Natural Science, Biology, and Medicine, Medknow Publications & Media Pvt Ltd, 2017, www.ncbi.nlm.nih.gov/pmc/articles/PMC5320817/. Topically applied agent, FDA cleared to reduce tooth hypersensitivity, is often used off label to arrest carious lesions. CPP binds to ACP preventing the dissolution of calcium and phosphate ions. (Test question #6) This works well to remineralize in an acidic environment. 27 Divyapriya, G. K., Puja Cox Yavagal, and D. J. Veeresh. "Casein Phosphopeptide-amorphous Calcium Phosphate in Dentistry: An Update." International Journal of Oral Health Sciences. N.p., 2016. Web. 2 June 2017. This ingredient has been found to rapidly occlude dentinal tubules to form a layer that acts as a protective barrier essentially decreasing dentinal hypersensitivity. 28 Litkowski, L., and D. C. Greenspan. "A Clinical Study of the Effect of Calcium Sodium Phosphosilicate on Dentin Hypersensitivity--proof of Principle." The Journal of Clinical Dentistry. U.S. National Library of Medicine, n.d. Web. 02 June 2017. Studies have shown that its use can increase the surface micro hardness of enamel. 29 Gurvits, Grigoriy E., and Amy Tan. "Burning Mouth Syndrome." World Journal of Gastroenterology: WJG. Baishideng Publishing Group Co., Limited, 07 Feb. 2013. Web. 02 June 2017. Toothpastes containing Sodium Laurel Sulfate (SLS) have been known to cause a drying effect and mucosal irritation in the oral cavity. 30 Golpayegani, M. Vahid, A. Sohrabi, M. Biria, and G. Ansari. "Remineralization Effect of Topical NovaMin Versus Sodium Fluoride (1.1%) on Caries-Like Lesions in Permanent Teeth." Journal of Dentistry (Tehran, Iran). Tehran University of Medical Sciences, 2012. Web. 02 June 2017.. Use should be limited. Why the body reprograms itself to attack healthy cells in autoimmune diseases is unknown. It is suspected that the possible cause of autoimmune disorders could be environmental or caused by antigens produced from within the human body triggering an inflammatory response to those who are susceptible. Autoimmune diseases can affect many areas of the human body. Many of these conditions have the potential to affect a person’s oral health in a negative way. Frequent visits to the dental practice are important to address issues early to ensure that patients avoid more invasive complications. 1. Feldman, Candace H., et al. “Epidemiology and Sociodemographics of Systemic Lupus Erythematosus and Lupus Nephritis among U.S. Adults with Medicaid Coverage, 2000–2004.” Arthritis and Rheumatism, U.S. National Library of Medicine, Mar. 2013, www.ncbi.nlm.nih.gov/pmc/articles/PMC3733212/. 2. “The History of Lupus.” Lupus Resource Center, Lupus Foundation of America, 26 Sept. 2017, resources.lupus.org/entry/history-of-lupus. 3. Uva, Luís, et al. “Cutaneous Manifestations of Systemic Lupus Erythematosus.” Autoimmune Diseases, Hindawi Publishing Corporation, 2012, www.ncbi.nlm.nih.gov/pmc/articles/PMC3410306/. 4. Khatibi, M, et al. “The Prevalence of Oral Mucosal Lesions and Related Factors in 188 Patients with Systemic Lupus Erythematosus.” Lupus, journals.sagepub.com/doi/abs/10.1177/0961203312454589. 6. “Lupus.” Centers for Disease Control and Prevention, Centers for Disease Control and Prevention, 12 Oct. 2017, www.cdc.gov/lupus/facts/detailed.html. 7. “Lupus.” Mayo Clinic, Mayo Foundation for Medical Education and Research, 25 Oct. 2017, www.mayoclinic.org/diseases-conditions/lupus/diagnosis-treatment/drc-20365790. 9. “Lichen Planus.” Lichen Planus | American Academy of Dermatology, www.aad.org/public/diseases/rashes/lichen-planus#symptoms. 10. Singh, N., and P. L. Cohen. "The T Cell in Sjogren's Syndrome: Force Majeure, Not Spectateur." Journal of Autoimmunity. U.S. National Library of Medicine, Sept. 2012. Web. 13 Apr. 2017. 11. Patton, Lauren L. The ADA Practical Guide to Patients with Medical Conditions. Ames, IA: Wiley-Blackwell, 2012. Print. 12. Expert, Patient, and Dorian Martin. “Sjögren's Syndrome Can Mimic Menopause Symptoms – Menopause | HealthCentral.” HealthCentral: Health News and Advice. Trusted Medical Information, Healthcentral, 9 May 2017,www.healthcentral.com/article/sjgrens-syndrome-can-mimic-menopause-symptoms. 13. Paganotti, Maurício Aquino, Valéria Valim, Érica Vieira Serrano, Samira Tatiyama Miyamoto, Raquel Altoé Giovelli, and Maria Carmen Lopes Ferreira Silva Santos. "Validation and Psychometric Properties of the EULAR Sjögren's Syndrome Patient Reported Index (ESSPRI) into Brazilian Portuguese." Revista Brasileira De Reumatologia (English Edition) 55.5 (2015): 439-45. Web. 14. Beckman, Kenneth A., Jodi Luchs, and Mark S. Milner. "Making the Diagnosis of Sjögren’s Syndrome in Patients with Dry Eye." Clinical Ophthalmology (Auckland, N.Z.). Dove Medical Press, 2016. Web. 14 Apr. 2017. 21. Ertugrul, Abdullah Seckin, et al. “Periodontopathogen Profile of Healthy and Oral Lichen Planus Patients with Gingivitis or Periodontitis.” International Journal of Oral Science, Nature Publishing Group, June 2013, www.ncbi.nlm.nih.gov/pmc/articles/PMC3707073/. 22. Jonsonn, Roland, et al. “Temporomandibular JointInvolvement in Systemic Lupus Erythematosus.” Arthritis and Rheumatism, vol. 26, no. 12, Dec. 1983, pp. 1506–1510. 31.Reichart PA et al. Dental implants in patients with oral mucosal diseases - a systematic review. J Oral Rehabil. 2016;43(5):388–99. 16. Negoro, A., M. Umemoto, M. Fujii, M. Kakibuchi, T. Terada, N. Hashimoto, and M. Sakagami. "Taste Function in Sjögren's Syndrome Patients with Special Reference to Clinical Tests." Auris, Nasus, Larynx. U.S. National Library of Medicine, June 2004. Web. 24 May 2017. 17. Mizuno, Y., T. Hara, K. Hatae, T. Hirano, K. Ueda, N. Nakamura, and Y. Mizoguchi. "Recurrent Parotid Gland Enlargement as an Initial Manifestation of Sjögren Syndrome in Children." European Journal of Pediatrics. U.S. National Library of Medicine, Feb. 1989. Web. 07 Apr. 2017. 18. Pedersen, Anne Marie Lynge, Allan Bardow, and Birgitte Nauntofte. "Salivary Changes and Dental Caries as Potential Oral Markers of Autoimmune Salivary Gland Dysfunction in Primary Sjögren's Syndrome." BMC Clinical Pathology. BioMed Central, 2005. Web. 19 May 2017. 19. Bolstad, Anne Isine, and Kathrine Skarstein. "Epidemiology of Sjögren's Syndrome-from an Oral Perspective." SpringerLink. Springer International Publishing, 02 Sept. 2016. Web. 07 Apr. 2017. 20. Baliga, Sharmila, Sangeeta Muglikar, and Rahul Kale. "Salivary PH: A Diagnostic Biomarker." Journal of Indian Society of Periodontology. Medknow Publications & Media Pvt Ltd, 2013. Web. 19 May 2017. 23. Neary, Nicola, and Lynnette Nieman. “Adrenal Insufficiency- Etiology, Diagnosis and Treatment.” Current Opinion in Endocrinology, Diabetes, and Obesity, U.S. National Library of Medicine, June 2010, www.ncbi.nlm.nih.gov/pmc/articles/PMC2928659/. 24. Sjogren's Syndrome Lifestyle and Home Remedies. Mayo Clinic. N.p., n.d. Web. 13 Apr. 2017. 25. Devani, Alim, and Benjamin Barankin. “Answer: Can You Identify This Condition?” Canadian Family Physician, College of Family Physicians of Canada, June 2007, www.ncbi.nlm.nih.gov/pmc/articles/ PMC1949217/. 26. Janakiram, Chandrashekar, et al. “Xylitol in Preventing Dental Caries: A Systematic Review and Meta-Analyses.” Journal of Natural Science, Biology, and Medicine, Medknow Publications & Media Pvt Ltd, 2017, www.ncbi.nlm.nih.gov/pmc/articles/PMC5320817/. 27. Divyapriya, G. K., Puja Cox Yavagal, and D. J. Veeresh. "Casein Phosphopeptide-amorphous Calcium Phosphate in Dentistry: An Update." International Journal of Oral Health Sciences. N.p., 2016. Web. 2 June 2017. 28. Litkowski, L., and D. C. Greenspan. "A Clinical Study of the Effect of Calcium Sodium Phosphosilicate on Dentin Hypersensitivity--proof of Principle." The Journal of Clinical Dentistry. U.S. National Library of Medicine, n.d. Web. 02 June 2017. 29. Gurvits, Grigoriy E., and Amy Tan. "Burning Mouth Syndrome." World Journal of Gastroenterology: WJG. Baishideng Publishing Group Co., Limited, 07 Feb. 2013. Web. 02 June 2017. 30. Golpayegani, M. Vahid, A. Sohrabi, M. Biria, and G. Ansari. "Remineralization Effect of Topical NovaMin Versus Sodium Fluoride (1.1%) on Caries-Like Lesions in Permanent Teeth." Journal of Dentistry (Tehran, Iran). Tehran University of Medical Sciences, 2012. Web. 02 June 2017.